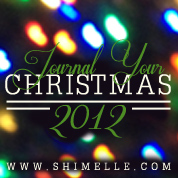 Although I'm not managing to blog much, I am managing to keep up with the JYC prompts. Having the pages already pre-made has definately helped. I play catch up every few days, when I can squeeze in a crafty moment. I had originally thought I would just journal this year, but looking back over Christmas photos gone by, I have decided to add them in between. Some from this year and some from prior years - they may reflect the subject of the prompt or they may just be because I like the photo. This will probably happen when I have a few days off between Christmas and New Year when I have time to locate all the photos etc! Here are my pages so far. Hopefully by the time you read this I wil have caught up again and done 7,8 and 9! Excuse the rubbish photos due to lack of daylight but if I don't take them when I can grab a moment, I'll never take them. The whole process is helping me enjoy the month of December, instead of getting stressed about how much I have to do. Have a Christmassy weekend whatever you are doing! Like your pages Lynn..hope your own weekend is going well! Married with two beautiful daughters. I work part time as an accounts assistant. In between all the things I have to do, I try to find time to create!